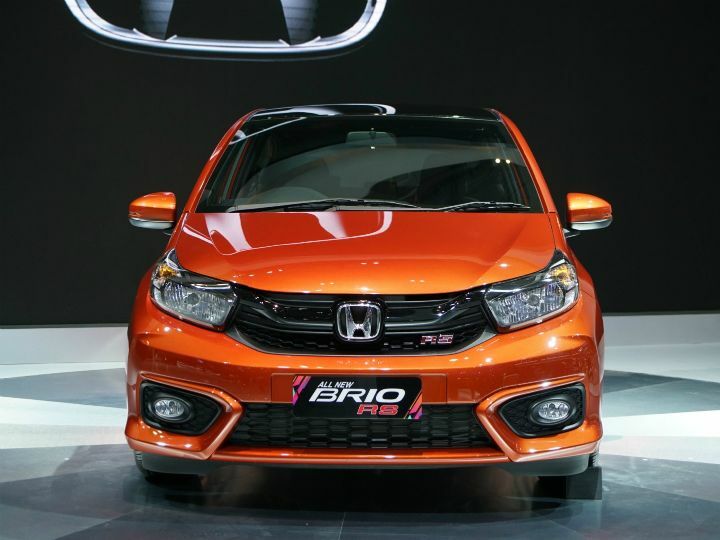 Honda has unveiled the second-generation Brio at the ongoing Gaikindo Indonesia International Auto Show in Jakarta. Based on the Honda Small RS Concept unveiled earlier this year, the new hatchback looks significantly different to the one currently sold here. So let’s take a look at what’s changed. 1. Small Honda, Big Changes! The all-new Honda Brio looks nothing like the car it replaces. The all-glass boot lid of the first-gen Brio has been ditched in favour of a more conventional one, making the design seem a lot more mature The front end of the new Brio is very similar to the second-gen Amaze currently sold in India. Like the sedan, the new Brio gets headlamps with light guides too. It is also longer than before and features a new set of 14-inch alloy wheels. The sportier RS version features bigger alloy wheels and a sweet looking rear spoiler. Now let’s compare the dimensions of the outgoing model with the new one, shall we? Step inside the cabin of the new Brio and you could easily mistake it for the outgoing model. That’s because the 2018 Brio gets the same functional dashboard as before. However, Honda claims that the new Brio offers more space when compared to its predecessor, especially in terms of the overall volume of the boot. And although the front seats look identical, the rear bench has been tweaked with the addition of adjustable headrests. The second-gen Amaze, on the other hand, gets an all-new dashboard setup and a new touchscreen infotainment system with Android Auto and Apple CarPlayCaPlay connectivity. We wish the new Brio also featured the same. Surprisingly, the new Brio’s feature list is quite bare bones, at least for the Indonesian market. It gets minimal features as a 2DIN music system, a manual AC, steering-mounted audio controls and a basic analogue instrument cluster. The RS variant packs in a touchscreen, red accents and a pair of tweeters as well. The new Brio continues to be powered by the 1.2-litre i-VTEC petrol engine that produces 90PS of power and 110Nm of torque. Transmission options include a 5-speed manual and a 7-step CVT. Although the RS variant gets the same engine, it is equipped with a retuned suspension that promises to offer a sportier driving experience. Honda is yet to reveal if the second-gen Brio will get the 1.5-litre i-DTEC diesel motor. While there’s no confirmation from Honda India regarding the new Brio, the manufacturer could choose to launch the hatchback in mid-2019. The India-spec Brio is due for an update and a new generation model might be just what Honda needs to reclaim lost ground in the segment. If launched, expect the new Brio to be priced in the range of Rs 5 lakh to Rs 7 lakh. Also, we expect it to pack more features to take on established rivals such as the Maruti Suzuki Swift and the Hyundai Grand i10. I am eager to known the launching date of Brio new gen car in cvt modelas i am fully satisfied to watch it on U Tube. I am eager to known the launching date of Brio new gen car in cvt modelas i am fully satisfied to watch it on U Tube. Share your experiences with Brio 2019?